The recent G20 summit in London brought into sharp focus the level of police violence and intimidation in our society. 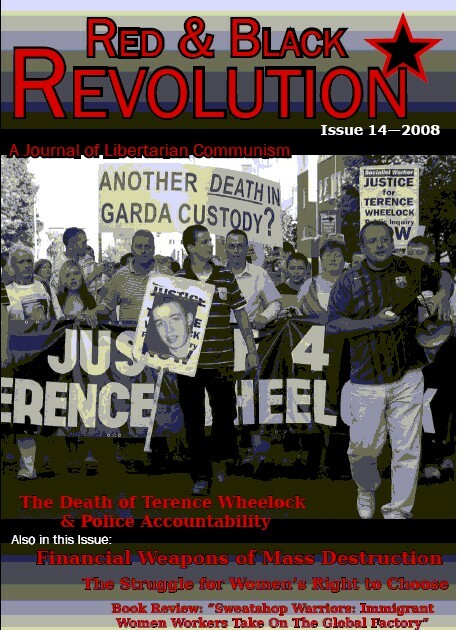 Belfast discussion: Can Direct Action achieve change? The Visteon workers have shown that we are far from powerless in resisting job and pay cuts. The discussion will focus on the Visteon/Ford workplace occupations, solidarity and the politics of direct action. What has happened in Erris over the past two weeks is unprecedented in the harassment by security forces (both private and state) and the fight back by the community is astounding and inspirational. Sean Mallory having spent time in mayo recently outlines the main events over the past two weeks. The long running struggle in Erris (Rossport) against Shell's attempt to impose an experimental gas pipeline on the local community has once more errupted in recent days with the arrival of the Solitaire to attempt to bring the pipeline to shore. In his article Erris: Community in Struggle against Shell WSM member Sean Mallory details the latest events following the resumption of construction. Here we provide background articles on the struggle and a focus on the events of last Summer and Autumn which culminated in Shell having to halt construction over winter. Thirty or so anarchists marched with the WSM and/or Organise! at the Belfast May day march this year. Initially the rally was addressed by trade unionists including John Maguire, Visteon union convenor. Alan from the WSM described it as "A lovely sunny day with a good anarchist turnout." and reported that "several people I spoke to afterwards thought a minimum of 2,000 people were on the march, the majority of these from the unions with maybe 20% from different left groups"
At the May Day rally in Laleh Park, Tehran, May 1st, 2009 more than 150 workers and their families as well as activists of women’s and students’ movements were arrested. Four days after the May Day police crackdown, about 130 women and men are still incarcerated. They are detained in unacceptable conditions in section 204 of Tehran’s Evin Prison. 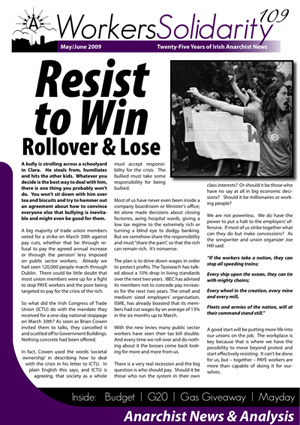 April saw Workers Solidarity Movement members from around the country meet for their twice-yearly conference. As the WSM has a much fuller concept of democracy, it organises itself quite differently to the way Fianna Fail, Sinn Fein, the DUP or Labour do. The conference is open to every member and every member can put a motion for consideration. Decisions are made by majority vote. As well as setting out policy, the conference also elects officers and discusses how to put our policies into action in our day-to-day political activity. Dublin: "Queer Politics: Mainstream or Revolutionary?" WSM will be taking part in the 2009 Dublin 'Mayday' march this Saturday at 2pm organised by the Dublin Council of Trade Unions. Come along and celebrate with us. Manifs monstres et syndicats pas forcément loyaux envers les salarié-e-s, la crise en Irlande nous donne peut être un petit avant-goût de ce qui nous attend en France. Les communistes libertaires sont en pointe dans la lutte. A presentation by Miriam Turley ( Eglantine Community Garden , Belfast ), & Seoidin O'Sullivan (The South Circular Road Food Garden Project, Dublin ). The long running struggle in Erris (Rossport) against Shell's attempt to impose an experimental gas pipeline on the local community has erupted in recent days with repeated local direct actions against the compound Shell are trying to construct. Meanwhile the state at the behest of Shell continues to press vindictive prosecutions against local activists. Back in March retired school teacher Maura Harrington for jailed for 30 days, today the state returned for another pound of flesh and she was sentenced to another 7-10 days in Mountjoy prison. At very short notice over 20 activists from Dublin Shell to Sea gathered at the prison gates and showed their outrage by blocking the entrance of the prison van containing Maura in to Mountjoy for about twenty minutes.